Barrie & Jenkins. As New. 1969. Hardcover. 0214650669 . *** FREE UPGRADE to Courier/Priority Shipping Upon Request *** - *** IN STOCK AND IMMEDIATELY AVAILABLE FOR SHIPMENT - AS NEW, THE TEXT BLOCK IS PRISTINE, CLEAN, UNMARKED, AND IN EXCELLENT CONDITION - - 160 pages, many illustrations. Transworld. As New. 1971. Paperback. 0552987891 . *** FREE UPGRADE to Courier/Priority Shipping Upon Request *** - *** IN STOCK AND IMMEDIATELY AVAILABLE FOR SHIPMENT - AS NEW, THE TEXT BLOCK IS PRISTINE, CLEAN, UNMARKED, AND IN EXCELLENT CONDITION - - 160 pages, many illustrations. 1971-01-01. Good. Ships with Tracking Number! INTERNATIONAL WORLDWIDE Shipping available. May not contain Access Codes or Supplements. May be ex-library. Shipping & Handling by region. Buy with confidence, excellent customer service! New York: Clarkson N. Potter, Inc., ., 1970. 4to. pp. 160. many illus. (several full-page colour). index. cloth (dealer's rubberstamp & small abrasion to edge of front blank). dw. (scuffed with light wear to edges). First American Edition.. F. Hardcover. London : Barrie & Rockliff, (1969). First edition. A handsomely illustrated and influential guide to collecting antique maps, with an index of mapmakers, a bibliography, etc. Demy 4to (31cm). 160pp. Numerous plates and illustrations, some in colour. Original boards; very good in a lightly worn and price-clipped dust-jacket. Barrie & Rockliff the Cresset P, 1969-01-01. Hardcover. Used:Good. Barrie & Jenkins. Hardcover. 0214650669 New Condition. . New. New York: Clarkson N. Potter, 1969. First American. Hardcover. Very Good/very good. color and b&w reproductions. 4to, 160 pages, cloth "In the context of this book it should be understood that the word 'investing' means buying old maps wisely." "This book is writtenas a guide to the maps which are likely to be found on the market, to describe how they were made and as far as possible to give an idea of their values, in order that the prospective purchaser should invest his money wisely." The Baytons had a multigenerational map business in London. Color and b&w reproductions. Clarkson N. Potter, Inc.. Very Good- in Very Good dust jacket. 1969. Hardcover. Mylar protected dustjacket. Boards edgeworn. Stains on top edge. Small stain spots on ffep and title page. Endpapers yellowed. ; 12" tall . Book. Previously Read But still Good . Illustrated Card. Quarto. London : Barrie & Rockliff, . 160 p. : illus., facsims., maps (part col.) ; 31 cm. All of our books are in the shop, and are 'real' books. We try to post the same day as the order. Descriptions are conservative. Postage rates may be lower than ABE estimate, please use Ask Bookseller a Question to confirm availability and postage cost, use [Ask Bookseller a Question] option below to confirm availability and get accurate postage quote for this item (the amount quoted is for an 'average' hard-cover book of up to 1kg in weight). london: Barrie & Rockliff the Cresset P., 1969. Book. Near Fine. No Binding. 1st Edition. London : Barrie & Rockliff, . 160 p. : illus., facsims., maps (part col.) ; 31 cm. Since 1920, when map collecting began in earnest, there have been many specialised books published on the subject of old maps and atlases. Most of them, written by the great authorities in the field, deal either with museum pieces and extreme rarities, or with only one aspect of the subject. This is the first comprehensive guide for beginners and new collectors, for it not only discusses the range of maps which can be found on the market today, and gives, as far as possible, approximate indications of their value, but also describes the methods by which the maps were made, and the men who made them. Equally, the wide range of material covered contains much that will be of interest to the experienced collector and the dealer. A recent survey of antiques by The London Times Saturday Review has shown that over a period of twenty years old maps and atlases, together with old master prints, have proved to be a superlative investment. Certainly maps can claim as wide an appeal, to the uninitiated as to the collector, and this book aims both to suggest ways in which to develop a collection and also to provide fascinating reading. Its special features include an index and guide to map-makers, engravers and publishers whose names will frequently be encountered in the course of collecting. The sixteen pages of faithful colour reproductions, coupled with the black and white illustrations throughout the book, have been carefully chosen to demonstrate the development of antique maps printed between 1540 and 1850. Roger Baynton-Williams is a partner with his father in the largest business in Britain dealing in old topographical prints. Their gallery is situated in South Kensington and has been established for more than forty years. Excellent condition in very good or better Dust Wrapper.r. Price Clipped. Blue boards with gilt to the Spine All of our books are in the shop, and are 'real' books. We try to post the same day as the order. Descriptions are conservative. Postage rates may be lower than ABE estimate, please use Ask Bookseller a Question to confirm availability and postage cost, use [Ask Bookseller a Question] option below to confirm availability and get accurate postage quote for this item (the amount quoted is for an 'average' hard-cover book of up to 1kg in weight). London: Barrie & Rockliff, The Cresset Press, 1969. Pp. 160, black & white illustrations throughout coupled with 16-pages of colour reproductions. Includes and index and guide to map-makers, engravers, and publishers. Small wrinkle to front blank with minor soiling to extreme fore-edge margin, else near fine. Dust jacket is price-clipped, else near fine.. First Edition. Navy Cloth. Near Fine/Near Fine. Quarto. Clarkson N. Potter, Inc.. 1969. Hardcover. Very good, a little top page edge toning and a small stray red pen mark, not a remainder mark Solid binding, clean text. Very good dust jacket. Dust jacket is in an older protective cover. Oversize. ; B&W and Color Illustrations. ; 160 pages . New York: Clarkson N. Potter. 1969. First Edition; First Printing. Hardcover. Book condition is Very Good; with a Very Good price clipped dust jacket. Foxing to page edges. Text is clean and unmarked. ; 4to 11" - 13" tall . Barrie & Jenkins. Hardcover. 0214650669 Like New Condition. . Fine. LONDON: BARRIE & ROCKLIFF. VG/VG. 1969. BOOK HAS LIGHT FOXING TO PAGE EDGES, GLUE REMAINS ON FFEP, DJ IN GLASSINE, SOME SHELFWEAR . Barrie & Jenkins, 1969-11. Hardcover. Good. 11.7000 inches 8.6000 inches. Dust jacket. Signed by author! London: Barrie & Rockliff, 1969. No marks or inscriptions. A very clean very tight copy with bright unmarked boards, minor foxing to page edges and no bumping to corners. Dust jacket price clipped but not marked or torn or creased. Protected in a fully-removable plastic sleeve. 160pp. 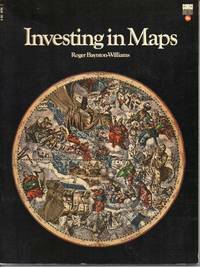 The ideal study for those interested in maps as an investment or just in collecting maps. It covers map making, the first printed maps onwards, sea charts, British, French and German map making, county histories, town plans and much more. Very well illustrated with maps of all types and ages.. First Edition. Hard Cover. Fine/Near Fine. 12 x 8.5 inches. London, Barrie & Rockliff The Cresset P, 1969. First Edition. Fine cloth copy in a near fine, very slightly edge-nicked and dust-dulled dw, now mylar-sleeved. Remains particularly and surprisingly well-preserved; tight, bright, clean and sharp-cornered. ; 160 pages; Impressively illustrated. Description: 160 p. Illus. , charts (some col. ) , maps (some col. ) . 31 cm. Subjects: Maps--Collectors and collecting..
LONDON, BARRIE AND ROCKCLIFF, 1969. FIRST EDITION, QUARTO, VERY GOOD, WITH DUSTWRAPPER, VERY WELL ILLUSTRATED. NY: Clarkson N. Potter. Very Good+ in Very Good+ dust jacket. 1969. First American Edition. Hardcover. First U.S. editon bound in blue cloth, illustrated, 160 pages. VG+ in dj. Has mild shelf wear, a few dust spots. ; 4to - over 9?" - 12" tall . Barrie & Jenkins. Hardcover. 0214650669 Hardcover with dust jacket. Book is in very nice condition, text is unmarked and pages are tight. . Very Good. New York: Clarkson N. Potter Inc., Publisher, 1969. Fine condition in a Fine dust jacket. NOT price clipped ($7.95). NO chips. NO tears. NO creases. Protected by a removable Brodart clear-plastic sleeve. Bright, shiny, clean, square. Sharp corners. NOT a library discard. NO owner's name or bookplate. NO underlining. NO highlighting. NO margin notes. 1969. First U. S. Edition. A useful guide to collecting maps that can be found on the market today (rather than museum pieces or extreme rarities). Covers map-makers, engravers, publishers, values, etc. Over 100 illustrations, many in full color. Bound in the original gilt-stamped dark blue cloth. Complete with dust jacket. Oversize Hardcover. 8.5" wide by 12" tall. This large, heavy book will require extra postage for Priority and International shipments, but only the standard charge for media mail.. First U. S. Edition. Oversize Hardcover. Fine condition/Fine dust jacket. 160pp. Great Packaging, Fast Shipping. London: Transworld Publishers, 1971. 160pp, index, bibliography, num bw & col plates. Pictorial card covers lightly edge worn. This is a comprehensive guide for beginning collectors discussing the range of maps available, approximate indications of value, the methods by which the maps were made, and the men who made them. Much also of interest to more experienced collectors. Lots of great illustrations (many in color) of some of the great maps of the past.. First Corgi Edition. Soft Cover. Very Good. 4to. Corgi Books. PAPERBACK. 0552987891 British SOFT COVERED reprint edition published in 1971. Virtually no wear to covers. The book itself is in Near Fine condition. The binding is straight and tight. NO remainder mark. All books are marked down 35% until February 1, 2019. Start stocking up now! . Fine. Cresset Press, 1969 Very good copy throughout of the introductory guide to map collecting.. First Edition. Cloth. Very Good/Very Good. 4to - over 9¾" - 12" tall. London : Transworld Publishers, 1971. First Edition. Fine copy in the original color-printed, stiff-card wrappers. Particularly and surprisingly well-preserved; tight, bright, clean and especially sharp-cornered.
. Series; A Corgi book. Physical description; 160 pages : illustrations, maps (some colour) ; 28 cm. Notes; ""A Corgi book""--verso of title-page. Includes bibliographical references (page 152) and index. Subjects; Maps - Collectors and collecting. Atlases and maps - Collectors' guides. Genres; Atlases. Bibliography. Illustrated. Maps and plans. still image. Corgi, 1971. Book. Near Fine. Oversize Paperback. Bookplate..
London: Corgi. Crisp and tight, light reading crease to spine. . Very Good. Soft cover. 1971. Acceptable. Ex library book with remainder marks etc else fine. New York: Clarkson N. Potter. 1969. 4to - over 9¾" - 12" tall. First Thus Used. H Hard Cover. Very Good. Light shelfwear to jacket extremities, name to endpaper, ]4to, 160pp. Transworld Publishers, 1971. Book. Good. paperback. paperback, light foxing to pre-lims o/w good, col'd plates, b&w illustrations, 160pp, ISBN:0552987891. London: Corgi. Crisp and tight, with minimal shelf-wear. Clipped halftitle. Crossed out owner's name to inside cover and halftitle. . Very Good. Soft cover. 1971. London: Corgi Books, 1971. No marks or inscriptions. No creasing to covers or to spine. A lovely clean crisp very tight copy with bright unmarked boards and no bumping to corners. 160pp. An excellent study on the history of maps and cartography with many illustrated examples in superb condition. . Soft Cover. Fine. 10.75 x 8 inches. Barrie & Rockliff the Cresset P, 1969. Hardcover. Good. Corgi Books 1971 soft cover reprint. The book is in very good condition, signed by author on title page. The covers are clean and bright, minor wear to edges, front cover creased. Binding tight, catalogue and price inscriptions. 160pp. Member of the Independent Online Booksellers Association. Signed by Author(s). Barrie & Jenkins. Hardcover. 0214650669 London; 1969. Blue cloth covered boards with gold spine titles; minimal edge wear; jacket has light edge wear; 4to, 9 3/4" - 12" Tall; Interior clean and unmarked; illustrations throughout; 160 pages. Additional shipping charges will be required for international orders. . Very Good. London : Transworld Publishers. Used - Very Good. Very Good condition. Barrie & Jenkins. Used - Good. Good condition. Good dust jacket. Stamped on endpage. Clarkson N. Potter. Used - Good. Good condition. Good dust jacket. Hardcover edition. Corgi Books. Used - Good. Good condition. Corgi, 09/24/1971. New edition. Paperback. Used; Good. **WE SHIP WITHIN 24 HRS FROM LONDON, UK, 98% OF OUR ORDERS ARE RECEIVED WITHIN 7-10 DAYS. We believe you will be completely satisfied with our quick and reliable service. All orders are dispatched as swiftly as possible! Buy with confidence! (London): Transworld Publishers Ltd, 1971. stiff paper wrappers. Maps. 4to. stiff paper wrappers. 160 pages. Reprint of the 1969 first edition. The first comprehensive guide for beginners and new collectors, it describes in detail the methods by which the maps were made, and the men who made them. A special feature includes an index and guide to map makers, engravers, and publishers. Sixteen pages of color reproductions and black and white illustrations throughout., showing the development of antique maps between 1540 and 1850.